ow I saw in my dream that they went forward until they were come to the brow of the hill; where PIETY, bethinking herself, cried out, "Alas! I have forgot what I intended to bestow upon CHRISTIANA and her companions. I will go back and fetch it." So she ran and fetched it. My dwelling place shall be." And shall from age to age endure." So CHRISTIANA asked PRUDENCE what 'twas that made those curious notes? "They are," said she, "our country birds: they sing these notes but seldom, except it be at the Spring, when the flowers appear and the sun shines warm; and then you may hear them all day long. I often," said she, "go out to hear them; we also oft times keep them tame in our house. They are very fine company for us when we are melancholy; also they make the woods, and groves, and solitary places, places desirous to be in. By this time PIETY was come again; so she said to CHRISTIANA, "Look here; I have brought thee a scheme of all those things that thou hast seen at our house, upon which thou mayest look when thou findest thyself forgetful, and call those things again to remembrance for thy edification and comfort." Now they began to go down the hill into the Valley of Humiliation. It was a steep hill, and the way was slippery; but they were very careful, so they got down pretty well. When they were down in the valley, PIETY said to CHRISTIANA, "This is the place where CHRISTIAN, your husband, met with the foul fiend APOLLYON; and where they had that dreadful fight that they had. I know you cannot but have heard hereof. But be of good courage; as long as you have here Mr. GREAT-HEART to be your guide and conductor, we hope you will fare the better." So when these two had committed the pilgrims unto the conduct of their guide, he went forward, and they went after. Great-heart. "We need not to be so afraid of this valley; for here is nothing to hurt us unless we procure it to ourselves. 'Tis true, CHRISTIAN did here meet with APOLLYON, with whom he also had a sore combat; but that fray was the fruit of those slips that he got in his going down the hill. For they that get slips there must look for combats here; and hence it is that this valley has got so hard a name. For the common people, when they hear that some frightful thing has befallen such an one in such a place, are of an opinion that that place is haunted with some foul fiend or evil spirit; when, alas, it is for the fruit of their doing that such things do befall them there. "This Valley of Humiliation is of itself as fruitful a place as any the crow flies over; and I am persuaded, if we could hit upon it, we might find somewhere hereabouts, something that might give us an account why CHRISTIAN was so hardly beset in this place." Then JAMES said to his mother, "Lo, yonder stands a pillar, and it looks as if something was written thereon; let us go and see what it is." So they went, and found there written, "Let CHRISTIAN'S slips before he came hither, and the battles that he met with in this place, be a warning to those that come after." "Lo," said their guide, "did not I tell you, that there was something hereabouts that would give intimation of the reason why CHRISTIAN was so hard beset in this place?" Then turning himself to CHRISTIANA, he said, "No disparagement to CHRISTIAN more than to many others, whose hap and lot his was. For 't is easier going up than down this hill; and that can be said but of few hills in all these parts of the world. But we will leave the good man--he is at rest, he also had a brave victory over his enemy; let him grant that dwells above, that we fare no worse, when we come to be tried, than he. "But we will come again to this Valley of Humiliation. It is the best and most fruitful piece of ground in all those parts. It is fat ground; and, as you see, consists much in meadows; and if a man were to come here in the summertime, as we do now, if he knew not anything before thereof, and if he also delighted himself in the sight of his eyes, he might see that that would be delightful to him. Behold, how green this valley is! also how beautiful with lilies! I have also known many labouring men that have got good estates in this Valley of Humiliation (for God resists the proud, but gives more grace to the humble); for indeed it is a very fruitful soil, and doth bring forth by handfuls. Some also have wished that the next way to their Father's house were here, that they might be troubled no more with either hills or mountains to go over; but the way is the way, and there's an end." Now as they were going along and talking, they espied a boy feeding his father's sheep. The boy was in very mean clothes, but of a very fresh and well favoured countenance; and as he sat by himself, he sang. "Hark," said Mr. GREAT-HEART, "to what the shepherd's boy saith." Is best from age to age." Then said their guide, "Do you hear him? I will dare to say that this boy lives a merrier life, and wears more of that herb called 'hearts-ease' in his bosom, than he that is clad in silk and velvet: but we will proceed in our discourse. "In this valley our Lord formerly had his country house; he loved much to be here. He loved also to walk these meadows; for he found the air was pleasant. Besides, here a man shall be free from the noise and from the hurryings of this life: all states are full of noise and confusion; only the Valley of Humiliation is that empty and solitary place. Here a man shall not be so let and hindered in his contemplation as in other places he is apt to be. This is a valley that nobody walks in but those that love a pilgrim's life. And though CHRISTIAN had the hard hap to meet here with APOLLYON, and to enter with him a brisk encounter--yet I must tell you, that in former times men have met with angels here; have found pearls here; and have in this place found the words of life. "Did I say, our Lord had here in former days his country house, and that he loved here to walk? I will add, in this place, and to the people that live and trace these grounds, he has left a yearly revenue to be faithfully paid them at certain seasons for their maintenance by the way, and for their further encouragement to go on their pilgrimage". Sam. Now, as they went on, SAMUEL said to Mr. GREAT-HEART, "Sir, I perceive that in this valley my father and APOLLYON had their battle; but whereabout was the fight, for I perceive this valley is large?" Great-heart. Your father had that battle with APOLLYON at a place yonder, before us, in a narrow passage just beyond Forgetful Green. And indeed that place is the most dangerous place in all these parts. For if at any time the pilgrims meet with any brunt, it is when they forget what favours they have received, and how unworthy they are of them. This is the place also where others have been hard put to it. But more of the place when we are come to it; for I persuade myself that, to this day, there remains either some sign of the battle, or some monument to testify that such a battle there was fought. (as CHRISTIAN did, for all he met with APOLLYON)." Great-heart. "'T is true," said their guide, "I have gone through this valley many a time, and never was better than when here. I have also been a conductor to several pilgrims; and they have confessed the same. 'To this man will I look,' saith the King, 'even to him that is poor and of a contrite spirit, and that trembles at my word.'" Now they were come to the place where the afore mentioned battle was fought. Then said the guide to CHRISTIANA, her children, and MERCY, "This is the place: and on this ground CHRISTIAN stood; and up there came APOLLYON against him. And look, did not I tell you, here is some of your husband's blood upon these stones to this day. Behold also, how here and there are yet to be seen upon the place some of the shivers of APOLLYON'S broken darts. See also how they did beat the ground with their feet, as they fought to make good their places against each other; how also with their by-blows they did split the very stones in pieces. Verily CHRISTIAN did here play the man, and showed himself as stout as could, had he been there, even HERCULES himself. When APOLLYON was beaten, he made his retreat to the next valley, that is called the Valley of the Shadow of Death--unto which we shall come anon. Lo, yonder also stands a monument on which is engraven this battle, and CHRISTIAN'S victory, to his fame throughout all ages." hen they had passed by this place, they came upon the borders of the Shadow of Death, and this valley was longer than the other; a place also most strangely haunted with evil things, as many are able to testify. But these women and children went the better through it, because they had daylight; and because Mr. GREAT-HEART was their conductor. When they were entered upon this valley, they thought that they heard a groaning as of dead men--a very great groaning. They thought also they did hear words of lamentation spoken, as of some in extreme torment. These things made the boys to quake; the women also looked pale and wan; but their guide bade them be of good comfort. So they went on a little farther, and they thought that they felt the ground begin to shake under them, as if some hollow place was there; they heard also a kind of a hissing as of serpents; but nothing as yet appeared. Then said the boys, "Are we not yet at the end of this doleful place?" But the guide also bade them be of good courage, and look well to their feet; "Lest haply," said he, "you be taken in some snare." Now JAMES began to be sick; but I think the cause thereof was fear; so his mother gave him some of that glass of spirits that she had given her at the INTERPRETER'S house, and three of the pills that Mr. SKILL had prepared; and the boy began to revive. Thus they went on, till they came to about the middle of the valley; and then CHRISTIANA said, "Methinks I see something yonder upon the road before us, a thing of such a shape such as I have not seen." Then said JOSEPH, "Mother, what is it?" "An ugly thing, child; an ugly thing," said she. "But, mother what is it like," said he. "'T is like I cannot tell what," said she. And now it was but a little way off. Then said she, "It is nigh." "Well, well," said Mr. GREAT-HEART, "Let them that are most afraid keep close to me." So the fiend came on, and the conductor met it; but when it was just come to him, it vanished to all their sights. Then remembered they what had been told some time ago, "Resist the devil, and he will flee from you." They went therefore on, as being a little refreshed; but they had not gone far, before MERCY, looking behind her, saw, as she thought, something most like a lion, and it came a great padding pace after; and it had a hollow voice of roaring, and at every roar that it gave, it made all the valley echo, and their hearts to ache, save the heart of him that was their guide. So it came up, and Mr. GREAT-HEART went behind, and put the pilgrims all before him. The lion also came on apace; and Mr. GREAT-HEART addressed himself to give him battle. But when the lion saw that it was determined that resistance should be made, he also drew back, and came no farther. Then they went on again, and their conductor did go before them, till they came at a place where was cast up a pit the whole breadth of the way; and before they could be prepared to go over that, a great mist and darkness fell upon them, so that they could not see. 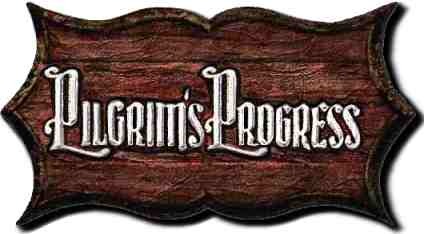 Then said the pilgrims, "Alas! now what shall we do?" But their guide made answer, "Fear not; stand still, and see what an end will be put to this also": so they stayed there because their path was marred. Then they also thought that they did hear more apparently the noise and rushing of the enemies; the fire also and the smoke of the pit was much easier to be discerned. Then said CHRISTIANA to MERCY, "Now I see what my poor husband went through. I have heard much of this place, but I never was here afore now; poor man! he went here all alone in the night--he had night almost quite through the way; also these fiends were busy about him, as if they would have torn him in pieces. Many have spoken of it; but none can tell what the Valley of the Shadow of Death should mean until they come in it themselves. 'The heart knows its own bitterness; and a stranger intermeddles not with its joy.' To be here is a fearful thing." Great-heart. This is like doing business in great waters, or like going down into the deep; this is like being in the heart of the sea, and like going down to the bottoms of the mountains. Now it seems as if the earth with its bars were about us for ever. "But let them that walk in darkness, and have no light, trust in the name of the Lord, and stay upon their God." For my part, as I have told you already, I have gone often through this valley, and have been much harder put to it than I am now; and yet you see I am alive. I would not boast, for that I am not mine own saviour; but I trust we shall have a good deliverance. Come, let us pray for light to him that can lighten our darkness, and that can rebuke, not only these, but all the Satans in hell. So they cried and prayed, and God sent light and deliverance: for there was now no let in their way; no not there, where but now they were stopped with a pit. Yet they were not got through the valley; so they went on still; and behold, great stinks and loathsome smells, to the great annoyance of them. Then said MERCY to CHRISTIANA, "Itis not so pleasant being here as at the Gate; or at the INTERPRETER'S; or at the house where we lay last." "Oh, but," said one of the boys, "it is not so bad to go through here, as it is to abide here always; and for aught I know that one reason why we must go this way to the house prepared for us is that our home might be made the sweeter to us." "Well said, SAMUEL," quoth the guide; "thou hast now spoke like a man." "Why, if ever I get out here again," said the boy, "I think I shall prize light and good way better than ever I did in all my life." Then said the guide, "We shall be out by and bye"
So on they went; and JOSEPH said, "Cannot we see to the end of this valley as yet?" Then said the guide, "Look to your feet; for you shall presently be among the snares." So they looked to their feet and went on; but they were troubled much with the snares. Now when they were come among the snares, they espied a man cast into the ditch on the left hand, with his flesh all rent and torn. Then said the guide, "That is one HEEDLESS, that was a going this way; he has lain there a great while. There was one TAKEHEED with him when he was taken and slain; but he escaped their hands. You cannot imagine how many are killed here about; and yet men are so foolishly venturous, as to set out lightly on pilgrimage, and to come without a guide. Poor CHRISTIAN! it was a wonder that he here escaped; but he was beloved of his God; also he had a good heart of his own, or else he could never have done it." Now they drew towards the end of the way; and just there, where CHRISTIAN had seen the cave when he went by, out thence came forth MAUL, a giant. This MAUL did use to spoil young pilgrims with sophistry; and he called GREAT-HEART by his name, and said unto him, "How many times have you been forbidden to do these things?" Then said Mr. GREAT-HEART, "What things?" "What things?" quoth the giant, "you know what things; but I will put an end to your trade." "But pray," said Mr. GREAT-HEART, "before we fall to it, let us understand wherefore we must fight" (now the women and children stood trembling, and knew not what to do). Quoth the giant, "You rob the country, and rob it with the worst of thefts." "These are but generals," said Mr. GREAT-HEART; "come to particulars, man." Then said the giant, "Thou practisest the craft of a kidnapper; thou gatherest up women and children, and carriest them into a strange country, to the weakening of my master's kingdom." But now GREAT-HEART replied, "I am a servant of the God of heaven; my business is to persuade sinners to repentance; I am commanded to do my endeavour to turn men, women and children from darkness to light, and from the power of Satan to God; and if this be indeed the ground of thy quarrel, let us fall to it as soon as thou wilt." Then the giant came up; and Mr. GREAT-HEART went to meet him. And as he went, he drew his sword; but the giant had a club. So without more ado they fell to it; and at the first blow, the giant stroke Mr. GREAT-HEART down upon one of his knees: with that, the women and children cried out. So Mr. GREAT-HEART, recovering himself, laid about him in full lusty manner, and gave the giant a wound in his arm; thus he fought for the space of an hour, to that height of heat, that the breath came out of the giant's nostrils as the heat doth out of a boiling cauldron. Then they sat down to rest them, but Mr. GREAT-HEART betook him to prayer; also the women and children did nothing but sigh and cry all the time that the battle did last. When they had rested them, and taken breath, they both fell to it again; and Mr. GREAT-HEART with a full blow, fetched the giant down to the ground. "Nay, hold, and let me recover," quoth he. So Mr. GREAT-HEART fairly let him get up, so to it they went again: and the giant missed but little of all-to-breaking Mr. GREAT-HEART'S skill with his club. Mr. GREAT-HEART seeing that, runs to him in the full heat of his spirit, and pierces him under the fifth rib; with that the giant began to faint, and could hold up his club no longer. Then Mr. GREAT-HEART seconded his blow, and smote the head of the giant from his shoulders. Then the women and children rejoiced; and Mr. GREAT-HEART also praised God for the deliverance he had wrought.